Bathgate-Gate - A New Twist On The Phrase 'Hunt Saboteur' ? Topic: Bathgate-Gate - A New Twist On The Phrase 'Hunt Saboteur' ? Re: Bathgate-Gate - A New Twist On The Phrase 'Hunt Saboteur' ? In the Robert Buckland column, Swindon Advertiser today, he says "To hear a senior politician say "sorry" is welcome and refreshing". I wonder if, when writing this, he glanced over to the North Swindon section of the shared constituency office. Those who have deliberately mislead the public should resign. 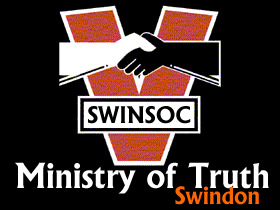 Blogged: Swindon's Ministry of Truth: Councillors Re-writing History of WiFi-Lies? "Yesterday it became apparent that Councillor Andrew Bennett, a Conservative member of the Swindon Borough Council Scrutiny Committee, was hurriedly telling anyone who would listen that Deputy Leader of Swindon Borough Council & Director of Digital City (UK) Ltd Cllr Garry Perkins had not claimed that members of the public were responsible for Enterprising Bathgates rejection of Digital City, but had instead told the scrutiny committee that the rejection was caused by â€˜media coverageâ€™ of the WiFiâ€™asco." Did Margaret Thatcher Open Door For www.talkswindon.org ? Perhaps Bon Neill MP should be reading talkswindon and learn about Hyper Local here? Councils should open up their public meetings to local news 'bloggers' and routinely allow online filming of public discussions as part of increasing their transparency, Local Government Secretary Eric Pickles said. Local Government Minister Bob Neill has written to all councils urging greater openness and calling on them to adopt a modern day approach so that credible community or 'hyper-local' bloggers and online broadcasters get the same routine access to council meetings as the traditional accredited media have. "Fifty years ago, Margaret Thatcher changed the law to make councils open their meetings to the press and public. This principle of openness needs to be updated for the 21st Century. More and more local news comes from bloggers or citizen journalists telling us what is happening at their local council. Many councils are internet-savvy and stream meetings online, but some don't seem to have caught up with the times and are refusing to let bloggers or hyper-local news sites in. With local authorities in the process of setting next year's budget this is more important than ever. Is it a case of Thatcher kicks Pickles who then follows whilst TS leads? A reliable 'Fly-on-the-wall' told me last night that Mr. Hunt's lavish house in Belmont Crescent has been up for sale for some time, the price now conspicuously reduced in a seeming fever for a sale. Can't imagine that it is in any way a gesture (or claim) in support of Local Authority interests, so one's imagination 'runs' in different directions. Anyone else disposed to imagine? I think that this has been doing the rounds since October but are we really interested or should others be more interested? I am not sure who you mean by 'we' and 'others'. (This) One's hackles bristle a bit in a situation as this, where significant private assets are being manoeuvred, voluntarily or otherwise? I wouldn't worry about what Ringer says Dave, he tends to talk in code, rarely ventures an opinion and always ends a sentence with a question mark. Don't include me with Ringers royal 'we'. My opinion for what it is worth, I am more interested in where the Avidity shares have gone. More importantly I wonder who else is preparing to bale as well? I am more interested in where the Avidity shares have gone. Has the council got its hands on all the shares now? I don't believe so. I actually don't think they necessarily want them either. If they hold 70% of the shares the actual relationship between SBC and DC changes. Not for the good in terms of scrutiny. 1. No officer of the Council (CEO, Director or political assistant or any assistant to any of the foregoing) has made an FOI request to West Lothian. Given that he publicly stated he had, or would submit one, I think it was reasonable to assume Cllr Perkins had actually authored, or cause to be authored, the FoI to West lothian council which referred to me, Chris Watts, Des Morgan and Steve Wakefield. I didn't bother pursuing the identity of the author because I assumed a serving councillor or officer or director would have just enough wit to cover their arse by getting a 3rd party to submit the FoI for them. If the Council own all the shares they will have to publish full accounts.